Designed your own card?? As long as the file is compatable, the price below is the price you will pay, no setups, design or other charges! 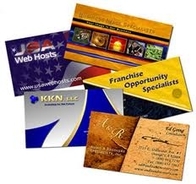 We usually provide 24 hour service on digital business cards. These extremely high quality cards take approximately 2 weeks to produce.